Coming off of a 9-6 loss to the Bowdoin Polar Bears, the women’s lacrosse team played its final home game of the season against Tufts on Saturday, April 19. The Jumbos are in sixth place in the NESCAC with a conference record of 5-4 and are ranked 17th in Division III. The Jumbos marked the sixth-straight nationally ranked team on the Cards’ schedule. Though the Cardinals contested diligently, they eventually fell 7-5. The first half of the game was marked by a strong defensive presence. After Tufts scored a goal about seven minutes into the game, there was no scoring for either side until the 6:27 mark, when Meredith Smith ’17 scored off an assist from Becca Phillips ’17. The Jumbos answered with a goal about two minutes later, which was followed up by Martha Harding ’16 scoring off of another assist from Phillips with about a minute left in the half to make it 2-2. The score remained tied at two at the intermission. The Jumbos opened up the scoring in the second half about three minutes in with a goal off of a free position shot to make the score 3-2, but the Cards bounced back strong with three consecutive strikes in a span of 74 seconds of game time. Smith netted her team-leading 19th goal of the season with a high shot at the 24:39 mark to tie the score at three. Harding netted her second goal of the game and her 14th of the year 32 seconds later off of an assist from Captain Abby D’Angelo ’14, giving the Cards their first lead of the game. Less than a minute after that, Leah Sherman ’15 broke through the middle of the Jumbos defense and scored the third of the Cardinal trio of goals to give Wesleyan a 5-3 lead. Unfortunately, the Cardinals were unable to hold onto that lead, as Tufts scored four unanswered goals over the final 17 minutes of play to extend the Jumbo winning streak against the Cards to seven games. The Cardinals had a chance to score in the closing moments of the game, as Smith hit the crossbar with 1:20 left. After the Cards regained possession, Harding took another shot from the left side that was saved. That was Wesleyan’s last chance to cut into the margin, as Tufts was able to keep possession for the rest of the game to close out the 7-5 victory. The Cardinals showed bursts of scoring prowess. Smith credited this to an altered offensive strategy. Katie Binswanger ’15 forced three turnovers in the game, bringing her season total up to 14, good for second-most on the team. 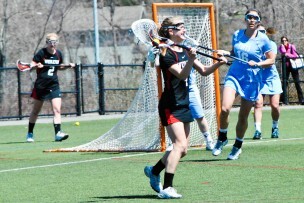 Captain Emma Frangules ’14 picked up a team-high three ground balls in the game. Meghan Kelly ’17, the team leader in grounders, picked up two more in the game to give her 27 on the season. Wesleyan keeper Nina Labovich ’16 came away with 11 saves on the day in a solid performance in net. Though their conference record is similar to what it was last season, the Cardinals have shown major improvement this season under new Interim Head Women’s Lacrosse Coach Amanda Belichick ’07. Though the Cardinals have not won in NESCAC play yet this season, they have consistently played tight games against elite, nationally ranked opponents, and have gone 5-0 in nonconference play. With a young, developing team, the Cards have a very bright future and lofty goals. “I think that we can become one of the highest nationally ranked teams,” Smith said. Wesleyan will close out the season on the road against the Conn College Camels on Wednesday, April 23. The Camels are also looking for their first NESCAC win on the season.